Most weeks, your share includes a member of the allium family, be it onions, scallions, shallots, or leeks. All of these have an oniony flavor, some stronger than others. Garlic is also in the allium family, but is not part of the share this year because garlic crops are planted in the fall, and we didn't have a lease on the farm until January, missing the opportunity to plant last year. Sweet Onions: You will find the onions harvested in the spring and summer have a sweeter, milder taste. Choose sweet onions that are heavy for their size without any bruises or blemishes. Shallots: Shallots are much smaller than onions, but they are not baby onions that haven't grown up. They are a distinct vegetable in the allium family. Choose shallots that are firm and heavy for their size. Avoid shallots that are sprouting or have any soft spots. Scallions: Select scallions with bright green tops and a firm white base. Avoid bunches with wet or wilted tops, which will spoil faster. Leeks: Smaller (i.e. skinnier) leeks are more tender. Choose leeks that are firm and straight. The leaves should be dark green and the bulbs white. Avoid leeks that have yellowing or wilted foliage or bruised bulbs. Sweet onions: Due to their high moisture content, sweet onions will not keep as long as cured onions (like the ones from the grocery store). Eat them within a few weeks. You can wrap each onion separately in a paper towel or newspaper and store them in the refrigerator in the crisper drawer. You can store them in a paper bag, but do not use a plastic bag. Storage onions (with dry skins) are harvested later in the season. These should be stored in a cool, dark place that is dry and well-ventilated. 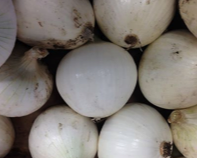 Moisture is a storage onion's enemy, so do not store these onions in plastic bags. You can store onions in pantyhose, separating each onion from the next with a knot. The pantyhose allow the moisture to continue to evaporate. Or try using perforated paper lunch bags. Onions should not be stored near potatoes which give off moisture that accelerates the decay of the onions. An interesting fact I learned is that the onions that are cured for storage are the ones that make you cry. The sulfurous compounds that irritate many people's eyes are the same compounds that help preserve the onions for longer storage. Shallots can be stored in a cool, dark place, much like storage onions. They will keep for up to 2 months. If they sprout, you can still use them. The sprout has a stronger, more bitter taste than the shallot flesh, so if you don't care for it, remove the sprout before using. Scallions: You can store scallions in a plastic bag in the refrigerator. Remove the rubber band, if any, and pay attention to the outer layers. As they begin to decay, you should remove the slimy layers to help the remaining scallions keep longer. I haven't tried it, but you can also keep the scallions in a jar with an inch or two of water, in the refrigerator (covered with a plastic bag) or on the counter. Change the water when it gets cloudy. Leeks: Store unwashed leeks in a plastic bag in the refrigerator. The plastic bag will help retain moisture. You can trim off the dark green tops, but keep the roots intact until you are ready to prepare them. The leeks should keep for a week or two. You can freeze peeled onions, diced or sliced into pieces, to use later in cooking. First, freeze the chopped onions on a baking sheet, that transfer to ziplock bags or containers. The frozen onions can be stored for 3-6 months, but they will lose flavor the longer they are stored, so try to use the onions within 6 weeks. In addition, be careful what you store the onions next to as they might share their flavor when first frozen. Other alliums like shallots, scallions, and leeks can be frozen for cooking (dice or slice them first) for up to 3 months. Follow the same instructions given for onions. The alliums in your share are typically used as aromatics to accent a recipe. Sweet onions won't have quite as strong a flavor as the others, but are delicious raw in salads or on sandwiches or burgers. If you haven't had caramelized onions, treat yourself. The natural sugars concentrate as the onions cook down, turning a dark burnished color. Caramelized onions are versatile and can be used in many recipes, such as to top a pizza or dress up pasta. Here are instructions for caramelizing onions. Some people recommend only using the white part of a scallion, but I use the whole thing. Use your own judgment. If you choose not to cook with the green stalks, consider adding them to a pot of stock. A tip from Jackie is to throw the dark green leek tops in a freezer bag with other trimmings and, once in a while, use them all for vegetable stock. If there is just one vegetable kept for this purpose, she makes leek tops a priority, both for their flavor and to salvage the high proportion of trimmings relative to useable leek. This is such a simple recipe. It's been a favorite at my house for decades. It also highly adaptable: if you have more or less leeks, you can make correspondingly more or less soup. The key is to use equal amounts (by volume) of potatoes, leeks, and stock. Heat oil in a large soup pot over medium heat. Saute leeks for about 4 minutes. Add the potatoes and stock. Bring to a boil; boil 2 minutes. Reduce heat and simmer until potatoes are tender, about 15 to 20 minutes. Season to taste with salt and nutmeg. Puree in the blender until smooth. Variation: For vichyssoise, add 2 cups light cream to the pureed soup, chill for at least 2 hours, and serve cold. Betsy Pollack is a LexFarm board member with a passion for cooking. She tries to eat as mindfully as possible, thinking about where food comes from, geographically and otherwise, eating seasonally, and supporting local agriculture. Grill onions, especially the sweet ones. This is one of the best pizzas ever. Try a caramelized onion tart like this one made with a Swiss cheese pastry crust or this one with fresh thyme. If you've never tried making the tiny German dumplings called spaetzle, it's fun (if a little messy). You can add caramelized onions for a hearty meal. If you caramelize the onions in advance, this pasta with a Greek yogurt sauce makes a quick dinner. Make homemade rosemary pasta topped with caramelized onions, walnuts and more rosemary. The Middle Eastern mujaddara is a delicious combination of lentils, rice, and caramelized onions, plain or topped with a spiced yogurt sauce. Mark Bittman says that crispy burnt onions take less time to make than caramelizing and are equally delicious. French onion soup, with or without the cheesy bread topping, is a delicious way to welcome the cooler weather. Or use a variety of onions in this English Onion Soup. Or just add leeks for this version with spicy croutons. Make a bulgur pilaf with spinach and fried onions. Using frozen spinach or blanched greens makes quick work of this recipe. Make a variation of chicken tikka. Marinate the chicken in yogurt and spices the night before, and grill the next day. The wonderful onions that go with the tikka in this recipe might be the best part. They are so simple and can be used with other menus. To make them, toss 3 sliced onions in lemon juice, oil, cumin, turmeric, and salt. Spread the mixture on a baking sheet and broil for about 10 minutes, mixing them around a bit halfway through cooking. Make some onion jam to use as a condiment, for example, this one with ginger and coriander or this with parsley, bay and rosemary or this with port and vinegar. Onion jam works best with yellow onions, rather than sweet eating onions. Try roasting leeks. You can use roasted leeks in a grain salad, such as this farro salad with roasted leeks, chickpeas, and currants. As with onions, you can caramelize leeks. Then you can add them to quiche, pasta, pizza, or beans. Here's a recipe for black-eyed peas and leeks. In Turkey, leeks are stewed in olive oil. This is a dish about leeks. It's delicious eaten at any temperature – hot, cold, room temp, and it keeps well for a few days. You could also make a version with beef. Try braising leeks with chicken broth and lemon, white wine and thyme, or white wine, garlic, and lemon. If you cook the leeks down even further with shiitake mushrooms, you get a jammy compote to complement roast pork. Leeks and scallions fill this leek and goat cheese quiche with a rye crust – a favorite of Betsy's! There are many twists on quiche with leeks. With a store-bought crust, you can quickly prepare quiche for dinner. Try a filling of leeks with Swiss chard. Go crustless with a leek, bacon, and gruyere quiche or a leek, greens, and herb quiche. You could even try a vegan quiche with leeks and mushrooms. Add leeks to lasagna along with artichokes. Leeks Vinaigrette is a classic French salad, spooning mustardy dressing on top of cooked leeks. Make a leek gratin by baking leeks in a béchamel sauce, or use cream or Gruyere cheese for something more decadent. Toss rye spaetzle with sautéed cabbage and leeks. Leek fritters with yogurt sauce offers a new twist on veggie fritters. In addition to the potato-leek soup featured above, try other variations such as this one with dill oil or this with potato gnocchi. Other vegetables can get in on the party, such as carrots, celery root, or broccoli. Top pizza with leeks along with mushrooms, roasted chicken, asparagus (in the spring), or lamb (optionally) and Pecorino. Steam fish over a bed of leeks in the oven or on the stovetop. Add leeks to stew, such as a beef stew, a simple chicken stew, or an adaptable vegetable stew. Shallots are excellent in a classic vinaigrette for salads. This citrus shallot vinaigrette can also served on greens, but would be terrific on beets or with avocado. Roast shallots with thyme and balsamic vinegar. Add sautéed or crispy fried shallots to green beans. Try a vegetarian pâté made with lentils and shallots. Pickle shallots to use as a condiment in just 20 minutes. Shallots are frequently used in Thai and Vietnamese cooking. Try frying shallots the Vietnamese way. You can then use the fried shallots in a prawn and noodle salad or a cucumber salad. And here are more ideas on how to use crispy fried shallots. Alternatively, fry shallots the Thai way being sure to save the flavorful oil to accent other dishes like this cilantro salad. You can then use the fried shallots with ground chicken, green beans, and noodles, in vegetarian pad thai, or, in a few weeks, on winter squash. Add shallots to the peanut sauce for this spring roll salad. Here are even more onion recipes from Saveur and leek recipes from Huffington Post.